Even at the height of their mainstream success, The Breeders were always a little bit weirder than was properly recognized. Sure, they wrote “Divine Hammer,” but that record also had “Roi” and “Mad Lucas” on it. So it’s fitting that the group’s new album gets some liner notes from a slightly odd writer. Neil Gaiman, last seen voicing Snowball V on The Simpsons and currently helping shepherd a TV-series adaptation of his novel Good Omens, is apparently a longtime fan of the American indie band. 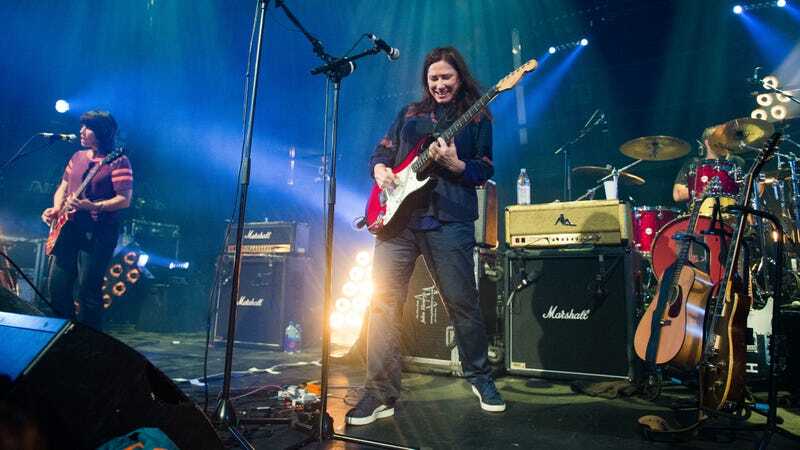 As a result, he’s written a short essay as part of the push for The Breeders’ new record All Nerve, the band’s first full-length album in a decade and the first proper reunion of the Last Splash lineup since the 2013 anniversary tour for that platinum-selling release. Now I’m twice the age I was when I first heard Kim Deal sing, and I live an ocean away from the English village in which I first played Pod. All of the things that were going to make life brighter and easier make life stranger and more confusing. Nothing feels as good as it used to feel, nothing tastes like it did. I used to think that the world was run by conspiracies of brilliant people. Now I would love to feel that there was any agenda, other than short-sighted greed and power-hungry bluster...And then All Nerve arrives and it’s as if no time at all has passed. You can read the entirety of the encomium on The Breeders’ website. All Nerve will be released March 2 on 4AD.